Whether young or old and no matter what culture you are a part of, God established a better way for us to communicate. With social media, texting, chat programs and the like, there are ample opportunities to speak... and what we say in person or via the before mentioned is communicated rapidly and sometimes we cannot recall what we just sent! The damage is done. We need to be those who build up and bring life with our words. There's also this common idea today that thinks by using say, foul language, it somehow makes the person more "relevant", "edgy", or have more "street cred"!? To be clear, this is the farthest thing from the truth! This is especially true if you are a follower of Christ! Spiritually speaking, you have a higher calling. Practically speaking, when you choose to constantly be explicit in what you say, lets just say that it doesn't make you look intelligent and obviously it shows, whether your realize it or not, that you don't care about what you say or to whom you're speaking. 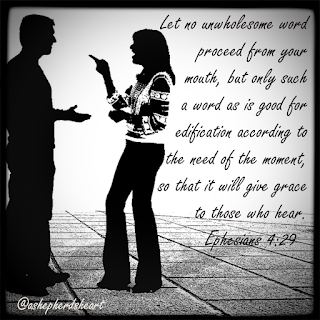 This isn't some legalistic thing rather, Ephesians 4:29 for example, is a loving instruction from Your Heavenly Father who knows there's a better way and a higher calling for you! We all slip up sometimes but that should be the exception - not the norm. So, the next time we want to cut someone down with our words, or drop the F Bomb or a derivative version or abbreviation, or the next time we want to use God's name as a curse word, or use some other fowl or hurtful words, I pray that Ephesians 4:29 comes to mind. It's OK (most of the time unless you need a time out before you speak) to communicate when upset or in conflict but the words we choose and who we represent matters. Same for the times when not angry or in conflict... our words matter! Don't speak in haste. Don't speak in hate. Don't speak word of negativity. Don't speak with vulgarity. Instead, choose your words wisely. Let's keep each other in prayer because again, our words matter and Who we represent matters more. Our words definitely matter. Unfortunately I have misspoken to often and have had to seek forgiveness but the words still mar the ones who received them. I've prayed asking God to tame my tongue or to make me mute. I'm still a work in progress. God bless! Great post! Thank you for your comments. That's probably true of all of us to some point if we're honest. We're all a work in progress so you're in good company! God Bless you! Thanks for your encouragement! Means a lot.